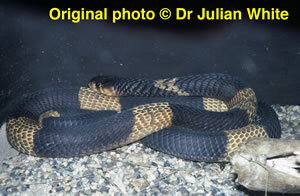 Large in length, slightly depressed to cylindrical, tapered and moderately slender bodied snake with a medium to moderately short length tail. Body is compressed dorsoventrally and sub-cylindrical posteriorly. Has long cervical ribs capable of expansion to form a hood when threatened. Can grow to a maximum of about 2.59 metres. Head broad, flattened and slightly distinct from neck. Canthus is distinct. Snout is rounded. Eyes are medium to moderately small in size with round pupils. Dorsal scales are long, smooth and strongly oblique. Dry to moist savanna and semi-desert regions with at least some water and vegetation ( never in desert regions ). Frequently found near water. Prefers toads but will eat small mammals, birds, eggs, lizards and other snakes. 175 to 300 mg ( dry weight ), Minton (1974) ( Ref : R000504 ).